My son insists on calling these strawberry cinnamon rolls because they look like cinnamon rolls, but with strawberries instead. I even almost named them strawberry cinnamon rolls, but I know I would get comments that would say there isn’t any cinnamon in these AND it’s true. 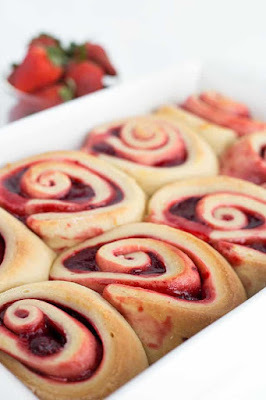 Soooo.. I’m going with strawberry sweet rolls and I think that’ll work out just dandy. I really love how these came out. I’m thinking of trying a couple other variations of this recipe too. We’ll have to wait and see if I EVER get around to it I suppose. I always have so many ideas and half of them never get to come to life. These strawberry sweet rolls have a homemade sweet roll dough that's been made with a strawberry cheesecake coffee creamer. It's rolled out and spread with cream cheese and a strawberry pie filling. It's the perfect spring breakfast or dessert! In a large saucepan, add the coffee creamer, butter, and sugar. Place over medium heat and stir occasionally. Once the butter is melted and the creamer is steaming, remove from the heat and let cool to room temperature. It took about 30 minutes to cool to room temperature for me. I used a thermometer to check when it hit 110 degrees to add in the yeast. Stir in the yeast and let it sit for about 5 minutes until it becomes slightly foamy. This means the yeast is activated. Add 4 cups of flour, baking soda, baking powder, and salt. Stir until just combined. It will be super sticky. Cover with a clean towel while still in the saucepan. Let the dough rise until doubled. It will take about 1 hour. I turn my oven on to about 200 while it's rising especially when it's cold out. Once the dough has doubled, add the remaining flour and stir until just combined. Totally optional, but you can rest the dough in the fridge for an hour or two to make it easier to handle. I skipped this step. I placed a couple of pieces of wax paper down and sprinkled 2 T. flour on it. Place dough onto the floured wax paper and sprinkle another 1 tablespoon of flour on top. Roll the dough out into a large 20-inch by 16-inch rectangle. In a small bowl, add the cream cheese and the 2 tablespoons of granulated sugar. Stir until the sugar is worked into the cream cheese. Using an offset spatula, spread the cream cheese on the dough. Be sure to cover all of the dough. This layer will be pretty thin. Add dollops of pie filling over the cream cheese layer. On one of the 20-inch side, leave 1 1/2 inches to 2 inches free of pie filling. Spread the filling all the way to the edge on the other 20-inch side. Spread the pie filling out using the same offset spatula. Slightly squish down any of the strawberries so they don't take up so much room when they're being rolling up. Starting at the 20-inch side that has the pie filling to the edge, roll the dough into a log.Get the rolls started by rolling them tightly by hand. Now that the rolling is started, use the wax paper and pull it up and over to help prevent the filling from squishing out so much. Make sure there is a wax paper to catch any filling that squishing out. Mark out for 2-inch rolls on the log. Grab a long piece of floss and slide it underneath the log. Crisscross the floss and pull together to cut the rolls. Place the rolls into a greased 9x13 cake pan. Cover with the towel that was used before and let rise for 20 - 30 minutes. Preheat the oven to 375 degrees while they're rising. Remove towel and bake in the preheated oven for about 45 minutes or until done. The tops will be golden brown. Tug on one of the center rolls and if it looks doughy, let it bake a little longer and check it again. In a small bowl, add the powdered sugar and coffee creamer. Stir until it's smooth. Using a spoon, drizzle the glaze on top of the cooled sweet rolls. 0 Response to "Strawberry Sweet Rolls"